"Being perfectly well-dressed gives one a tranquillity that no religion can bestow." - Ralph Waldo Emerson. "A man with a good coat upon his back meets with a better reception than he who has a bad one." - Dr. Johnson. FASHION DESIGN is the art of the application of design and aesthetics or natural beauty to clothing and accessories. Fashion design is influenced by cultural and social latitudes, and has varied over time and place. Fashion designers work in a number of ways in designing clothing and accessories. Some work alone or as part of a team. They attempt to satisfy consumer desire for aesthetically designed clothing; and, because of the time required to bring a garment onto the market, must at times anticipate changing consumer tastes. FASHION DESIGNERS attempt to design clothes which are functional as well as aesthetically pleasing. They must consider who is likely to wear a garment and the situations in which it will be worn. They have a wide range and combinations of materials to work with and a wide range of colors, patterns and styles to choose from. Though most clothing worn for everyday wear falls within a narrow range of conventional styles, unusual garments are usually sought for special occasions, such as evening wear or party dresses. Some clothes are made specifically for an individual, as in the case of haute couture or bespoke tailoring. Today, most clothing is designed for the mass market, especially casual and every-day wear. HAUTE COUTURE (French for "high sewing" or "high dressmaking") refers to the creation of exclusive custom-fitted clothing. Haute couture is made to order for a specific customer, and it is usually made from high-quality, expensive fabric and sewn with extreme attention to detail and finished by the most experienced and capable seamstresses, often using time-consuming, hand-executed techniques. Couture is a common abbreviation of haute couture and refers to the same thing in spirit. It originally referred to Englishman Charles Frederick Worth's work, produced in Paris in the mid-nineteenth century. In modern France, haute couture is a "protected name" that can be used only by firms that meet certain well-defined standards. However, the term is also used loosely to describe all high-fashion custom-fitted clothing, whether it is produced in Paris or in other fashion capitals such as Milan, London, New York and Tokyo. PRÊT-À-PORTER or READY-TO-WEAR (often abbreviated RTW; "off-the-rack" or "off-the-peg" in casual use) is the term for factory-made clothing, sold in finished condition, in standardized sizes, as distinct from made to measure or bespoke clothing tailored to a particular person's frame. Off-the-peg is sometimes used for items which are not clothing. Ready-to-wear has rather different connotations in the spheres of fashion and classic clothing. In the fashion industry, designers produce ready-to-wear clothing intended to be worn without significant alteration, because clothing made to standard sizes fits most people. They use standard patterns, factory equipment, and faster construction techniques to keep costs low, compared to a custom-sewn version of the same item. Some fashion houses and fashion designers produce mass-produced and industrially manufactured ready-to-wear lines, while others offer garments that, while not unique, are produced in limited numbers. 30 best men's fashion websites - The Telegraph. 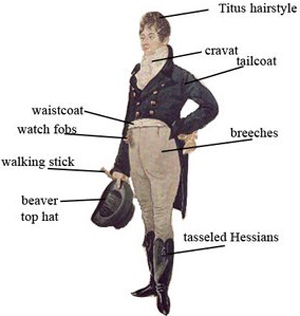 BEAU BRUMMELL - (1778-1840). Iconic figure in Regency England, the arbiter of men's fashion, and a friend of the Prince Regent, the future King George IV. He established the mode of dress for men that rejected overly ornate fashions for one of understated, but perfectly fitted and tailored clothing. This look was based on dark coats, full-length trousers rather than knee breeches and stockings, and above all immaculate shirt linen and an elaborately knotted cravat. PRÊT-À-PORTER | READY-TO-WEAR - Wikipedia. STYLECRAVE - mens fashion luxury clothing and accessories. STYLEPEDIA - Mr Porter's glossary of men's fashion. The Black Tie Guide - "A Gentleman's Guide to Evening Wear." THE ESSENTIALS - Mr Porter: The Classic Items Every Man Should Own. 5001 Flavors - since 1992. "Exclusive custom clothing company that caters to personalities in the entertainment and sports industries." A. CARACENI - Milan, Italy. 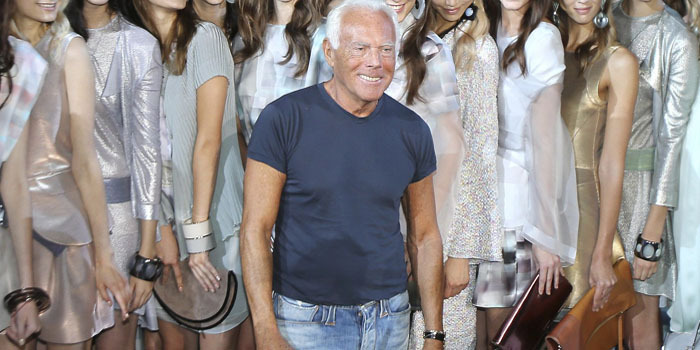 Alan Flusser - "Alan Flusser is one of the most knowledable experts on men's fashion." - Ralph Lauren. ALEXANDER AMOSU - "King of Bling Bling". 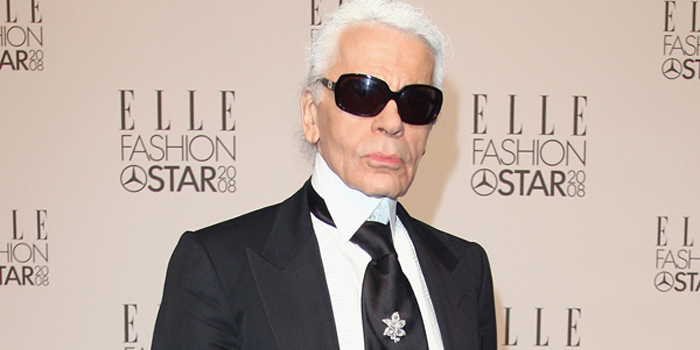 Creator of the world's most expensive suit: £70,000. See YOU TUBE VIDEO. ALLEGRI - "The Architects Of Fabrics." Inventor of water-resistant cashmere called Rain Cashmere. AMI Paris - since 2010. ANDERSON & SHEPPARD - 32 Old Burlington Street, London, U.K. Since 1906. Anita Dongre - recognized as India's leading Fashion house. ANTHONY J. HEWITT - 11 St. George Street, London, U.K. Since 1976. AQUASCUTUM - since 1851. "Understated British elegance." ASCOT CHANG - since 1953. 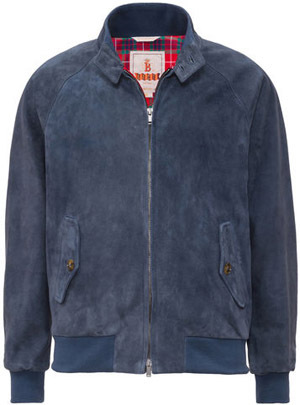 Baracuta - since 1937. Maker of the Harrington jacket is a lightweight waist-length jacket, made of cotton, polyester, wool or suede — usually with traditionally Fraser tartan or check-patterned lining. In 2007, to celebrate the 70th anniversary of its brand, Baracuta released three special edition G9 jackets with quotes by Presley, Steve McQueen and Frank Sinatra — all of them frequent wearers of the Harrington — printed on the lining. BENSON & CLEGG - 9 Piccadilly Arcade, London, U.K. Founded in 1937. BERLUTI - Paris since 1895. "The ultimate expression of luxury for men." BERNARD WEATHERILL - founded in 1910. 5 Savile Row, London, U.K.
BIJAN - Beverly Hills, CA, U.S.A. By appointment only. BILLS KHAKIS - "King of Khakis." LUIGI BORRELLI - founded in 1957. BOTTEGA VENETA - Ready to wear. Online shop. BRIONI - Italian fashion house founded in 1945. "To be one of a kind." 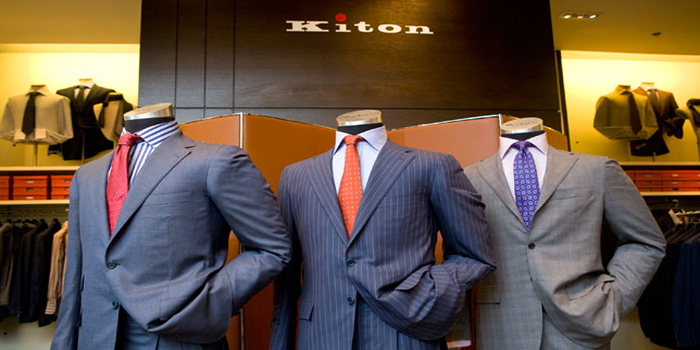 Specialises in the sale of hand-made suits. BROOKS BROTHERS - founded in 1818. The oldest men's clothier chain in the United States. BROWNS FASHION - the latest mens designer fashion collections from Dior Homme, Lanvin, Bottega Veneta, Balenciaga, Marni and more. Bugatchi - since 1981. Exists at the intersection of class and modernity. Synonymous with the luxury of Italian fabrics and design aesthetic. Bullock & Jones - since 1857. Butch Tailors - since 1956. BYRNE & BURGE - 11 St. George Street, London, U.K.
CAD & THE DANDY - 12 Savile Row, London, U.K.
CANADA GOOSE - committed to producing the best extreme cold weather outerwear in the world. CARVIL - Paris since 1952. Casely-Hayford - since 2009. "English Luxury Menswear House." CESARE ATTOLINI - since 1930. 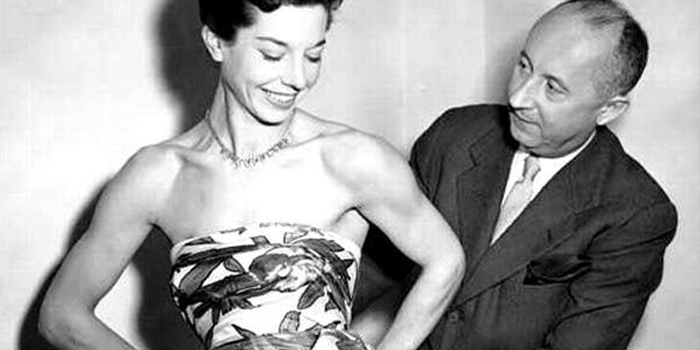 Synonym of Naples' tailoring tradition all around the world. CHARLIE ALLEN - 1 Coopers Yard, 181 Upper St., London, U.K. Established 1984. CHARVET - founded 1838. French high-end shirt maker and tailor located at 28, place Vendôme in Paris. CHITTLEBOROUGH & MORGAN - 12 Savile Row, London, U.K.
CORNELIANI - since 1958. "Italian brand leader in high-end elegant menswear." CROMBIE - "Timeless British menswear since 1805." Men's coats. DAKS - design, manufacture and retail of tailored garments and accessories for men and women. Dashing Tweeds - "We have recently opened a flagship store in Mayfair at the end of Savile Row at 26 Sackville Street London W1S 3HE, showcasing and selling both our fabric and ready to wear collections." DAVIES & SON - 38 Savile Row, London, U.K. Established 1803. The oldest independent tailor on Savile Row. Dayang TRANDS USA - Trands suits are a brand of designer suits created by Dalian Dayang Trands, a Chinese company. 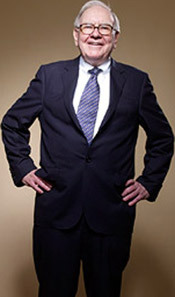 The company was founded in 1979 by Li Guilian. Trands is known for being worn by billionaires Warren Buffett, Bill Gates and the President of China Hu Jintao. In a video released by the company, Buffett praised the brand, saying he had thrown away all his other suits and only wears Trands. Degand - exclusive Belgian multi-brand e-store. 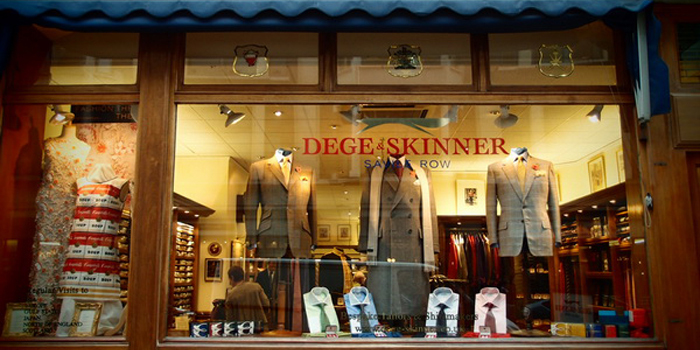 DEGE & SKINNER - 10 Savile Row, London, U.K. Founded in 1865. DENMAN & GODDARD - 11 St. George Street, London, U.K. Established 1797. E. TAUTZ - founded in 1867. "Ready to wear fashion label with a Savile Row aesthetic." EDE & RAVENSCROFT - 8 Burlington Gardens, Savile Row, London, U.K. Established 1689. EDWARD SEXTON - 26 Beauchamp Place, Knightsbridge, London, U.K. A favourite with the young In-crowd of London, plus City businessmen. English Laundry - "The Crossroads of Fashion, Rock and All Things English." ERMENEGILDO ZEGNA - founded in 1910. FAÇONNABLE - "Prêt-à-Porter Homme depuis 1950." GARY ANDERSON - 34-35 Savile Row, London, U.K.
GASSANE TAILORS - Austin, TX, U.S.A. Former US President George W. Bush's tailor. Gather & Hunt - custom-made clothing constructed in the Italian “sprezzatura” style. Georges de Paris - (1934-2015). French-American tailor who is often referred to as having been the President of the United States' unofficial tailor or the tailor to the Presidents. Paris fashioned suits for every American President from Lyndon Johnson to Barack Obama. GIANNI CAMPAGNA - Milan, Italy. His creations attract some of the most prestigious names in Hollywood and on Wall Street. 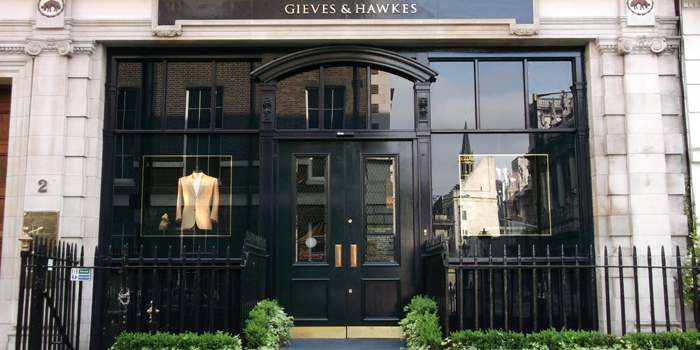 GIEVES & HAWKES - No. 1 Savile Row, London, U.K.
GILIBERTO DESIGNS - since 1979. Custom tailoring NYC. 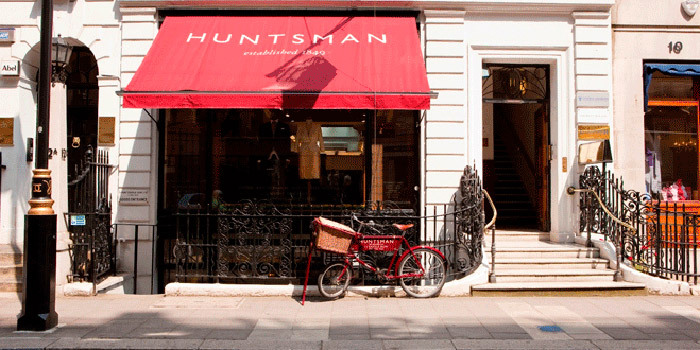 GRESHAM BLAKE - 64 South Molton Street, London, U.K.
H. HUNTSMAN - 11 Savile Row, London, U.K. Established 1849. HACKETT - "Essential British Kit." HARDY AMIES - 14 Savile Row, London, U.K. Established 1945. HART SCHAFFNER MARX - since 1887. HARVIE & HUDSON - 77 Jermyn Street, St. James's since 1949. HAWES & CURTIS - since 1913. Jermyn Street, London. Haspel - since 1909. Originator of the Seersucker suit. HEDI SLIMANE - French photographer and fashion designer. 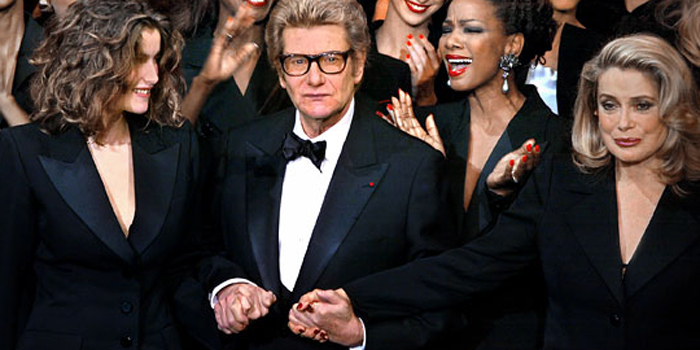 From 2000 to 2007, he held the position of creative director for Dior Homme (the menswear line of Christian Dior). He is currently the creative director for Saint Laurent Paris. HENRY POOLE & CO. - 15 Savile Row, London, U.K. Savile Row’s longest-standing atelier established 1806. HETTABRETZ | HB UOMO - founded in 1960. Hettabretz has become a leading brand for international aristocracy and celebrities. HOLLAND ESQUIRE - "Fine English Tailoring." The only place to view the full collection of coats, suits, jackets, shirts and knitwear. HOLLAND & HOLLAND - luxury ready to wear. HOLLAND & HOLLAND - mens 100% silk dressing gown. HOLLAND & SHERRY - 9-10 Savile Row, London, U.K. "The Finest Cloths in the World." Hugo Ferdinand Boss - (8 July 1885 – 9 August 1948). 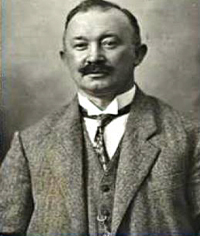 Founder of the clothing company Hugo Boss. Huntsman - since 1849. Savile Row, London, U.K. Ready To Wear. 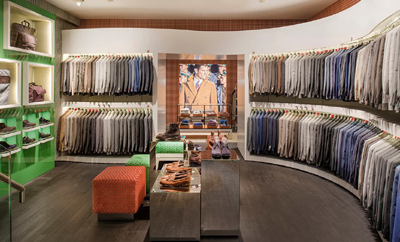 INDOCHINO - custom suits & mens suits. INIS MEÁIN KNITTING COMPANY - contemporary Irish knitwear, menswear & womenswear. ISAAC SELLAM - classic leather jackets. Isaia - since 1957. "The Neapolitan High-End Menswear Firm." ISSEY MIYAKE - supplier of Steve Jobs' signature mock turtleneck sweaters: "So I asked Issey to make me some of his black turtlenecks that I liked, and he made me like a hundred of them." J.PRESS - represents perhaps the quintessential Ivy League dress manner. JASPER LITTMAN - 9 Savile Row, London, U.K.
Jekyll & Hyde - leather jackets. JOHN PEARSE - 6 Meard Street, Soho, London, U.K.
JOHNSTON & MURPHY - since 1850. Johnstons of Elgin - since 1797. "Men's Luxury Cashmere Clothing." JOSEPH ABBOUD - "Style with Substance." 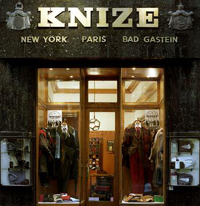 KILGOUR - Savile Row of London, U.K.
Knize - "Tradition since 1858." Vienna, Austria. LA Martina - "Shop The Look." Lanieri - "Italians Do Fit Better." Customise your very own made to measure suit. Start the journey by picking the fabric your prefer and start personalising your garment as you wish. Made in Italy. Lanz Trachtenmoden - since 1922. "Everyman is wearing Lanz." The history of Lanz starts in the twenties. The vision to make traditional costumes acceptable for everybody became true. Today the name Lanz is a synonym for high quality “Tracht” and for Salzburg and the Austrian lifestyle. One word describes everything – lanzy. That means tradition with innovation. Or simple: elegance and comfort combined. Larusmiani Milano - "Handmade in Italy since 1922." LORO PIANA - since 1924. High-end, luxury cashmere and wool products. LOUIS VUITTON - Ready to wear. LUCIANO BARBERA - since 1971. "The Classic Original Italian Style." LUTWYCHE - "Hand Tailored in England." 15 Clifford Street, London, U.K.
MAGEE CLOTHING - est. 1866. Margaret Howell - contemporary British clothing designer. 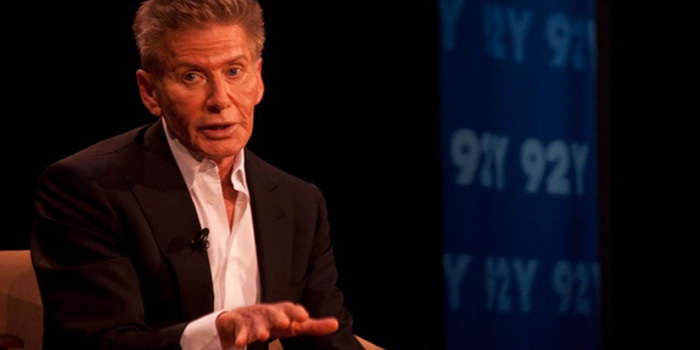 MARK POWELL - British fashion designer whose emphasis on bespoke tailoring has gained a celebrity clientele. MARTIN GREENFIELD - New York City, NY, U.S.A. Aka the Tailor's Tailor. Matchless - "The Innovator Since 1899." MATSUDA - "The label for today's young fashionable men." MATTHEW FARNES - 12 Savile Row, London, U.K.
MAURICE SEDWELL - 19 Savile Row, London, U.K. Established 1938. MEYER & MORTIMER - 6 Sackville Street, London, U.K.
Michael Bastian - CFDA award-winning luxury American menswear brand founded in 2006, designed in New York and made entirely in Italy. MICHAEL RESLAN - 689 Fifth Avenue, 15th Floor, Penthouse, New York City, NY, U.S.A. By appointment only. MIGUEL CABALLERO - "The Armani of armor." Exclusive bulletproof fashion apparel. Ministry of Supply - Boston-based high performance business wear men's fashion brand launched in 2012. MONTEDORO - since 1958. Urban sportwear. MORRIS & SONS - since 1952. MP di Massimo Piombo - "Envisaged and designed 'for beautiful people.'" Newman - "A cultural phenomenon dreamed in California in 1967." NINO CORVATO - New York City, NY, U.S.A. Italian master tailor. NORTON & SONS - 16 Savile Row, London, U.K. Established in 1821. Off-White - Italian streetwear and luxury fashion label founded by American creative designer Virgil Abloh in Milan, Italy in 2012. Oliver Wicks - "European Style." Because you probably have enough stuff made in China. Get your custom suit online - made in Europe from the best Italian wool for the ultimate style boost, tailored & delivered in 28 days. OXXFORD CLOTHES - since 1916. "Hand Made in Chicago." 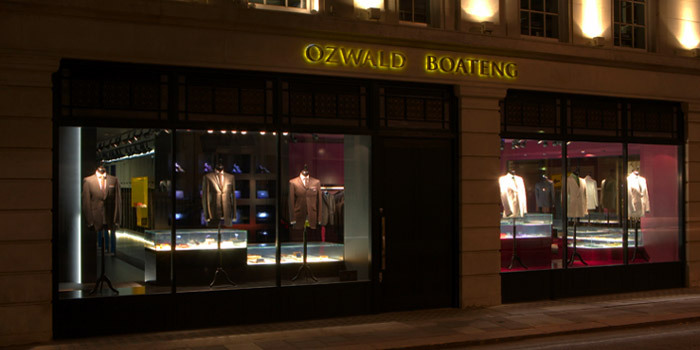 OZWALD BOATENG - 30 Savile Row, London, U.K. Coined the term bespoke couturier. PAUL SMITH - since 1970. PETER MILLAR - tailored suits. Piero Dimitri - since 1971. PORSCHE DESIGN P1140 RawTec Blazer - awarded the international Red Dot Design Award for 2012 in the Fashion, Lifestyle and Accessories category. Pyer Moss - "Founded in 2013, as mens and womenswear fashion label concerned with building a narrative that speaks about heritage and activism." 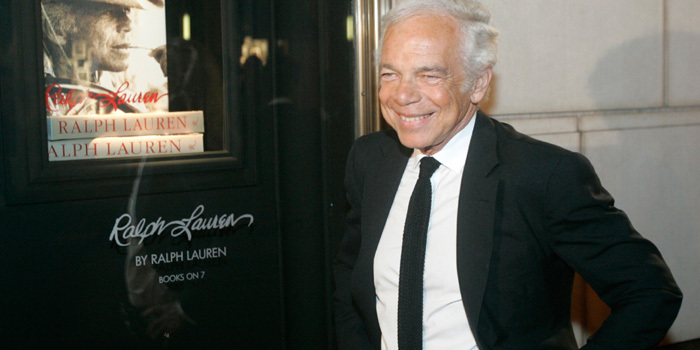 RALPH LAUREN - founded in 1967. RICHARD ANDERSON - 13 Savile Row, London, England, U.K. Ready-To-Wear & bespoke. RICHARD JAMES - 29 Savile Row, London, England, U.K.
Roderick Charles - 90 Jermyn St., London, England, U.K.
Rogers Peet - men's clothing company founded on November 6, 1874. Rogers Peet introduced several innovations into the men's wear business: they attached tags to garments giving fabric composition, they marked garments with price tags (the established practice was to haggle), they offered customers their money back if not satisfied. The last Rogers Peet store closed in the mid-1980s. RUBINACCI NAPLES - "The Innovators of Neapolitan Elegance." Saint James French Clothing - since 1889. SAM'S TAILOR - "In Hong Kong, the reputed home of the 24-hour suit." SANITATE TAILORS - New York City, NY, U.S.A.
Schott NYC - founded in 1913. The first company to put a zipper on a jacket. In the early 1950s they created the classic Perfecto 618 motorcycle jacket Marlon Brando wore in the movie The Wild One (1953). SIR TOM BAKER - 4 D'Arblay Street, Soho, London, U.K. Founded in 1996. SOUSTER & HICKS - 9-10 Savile Row, London, U.K.
SPYDER - Colorado-based manufacturer of high-end skiing apparel. World's largest ski specialty brand. St. Croix's Classic Long-sleeve Mock, Style 1990 - Steve Jobs, the late Apple CEO, often wore a St. Croix mock turtleneck at his keynotes. STEED - 12 Savile Row, London, U.K.
STEFANO RICCI - luxury men's clothing. STEVEN HITCHCOCK - 13 Savile Row, London, U.K.
STEWART & STRAUSS - world's largest selection of varsity jackets. STOWERS BESPOKE - 13 Savile Row, London, U.K. Bespoke, made-to-measure and ready-to-wear. STRELLSON - "Urban fashion for men who are alwats on the move." STUART LAMPRELL - 6 Sackville Street, London, U.K.
Suitart - "With class and style - the tailor-made suit of SuitArt." Suitsupply - "Impeccable suiting since 2000." 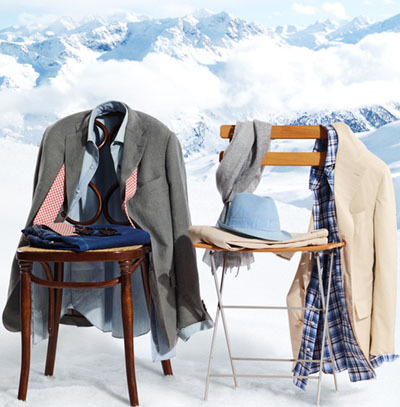 Our range is wide and versatile and consists of jackets and trousers, shirts, accessories and shoes that allow customers to purchase prêt à porter fashion items as well as made-to-measure garments. Sulka - (1893-2001). Haberdasher to Royalty. The Alan Flusser Custom Shop - 3 East 48th Street, 3rd Floor, New York City, NY, U.S.A. The Lost Explorer - "Live Curiously." Goods, apparel and things you didn’t know you needed. THOM Sweeney - "Luxury Menswear & Bespoke Tailoring." 1-2 Weighhouse St, Mayfair, London, U.K.
THOMAS MAHON - 20 Savile Row, London, U.K. TIE YOUR TIE - since 1984. via Ciro Menotti, 2/a 2/b, Florence. Italian luxury menswear and accessories. TIMOTHY EVEREST READY-TO-WEAR - "The quintessential British tailor who enjoys the highest critical acclaim for his eccentric style and modern attitude." TOD'S - Made in Italy since 1920. Designer ready-to-wear. TOM BROWN TAILORS - London & Eton, U.K.
TOM FORD - James Bond’s tailor for the 23rd Bond film. TRILLION - Palm Beach, FL, U.S.A.
uman - launched in 2009 by Umberto Angeloni. VARSITY JACKETS DIRECT - customized to your exact specifications. VIP BODY ARMOR - "The premier provider in bulletproof fashion, VIP Body Armor / VIP Body Armor designs bulletproof clothing that embodies fashion with security." Visvim - by Hiroki Nakamura. Vitale Barberis Canonico - established in 1663. Italian fabric mill. Its largest customer is the Italian fabric mill and luxury menswear fashion house Ermenegildo Zegna. Vitale Barberis Canonico has remained a family-owned business for 15 generations. Vivo Masks - "Handmade designer masks." Authentic Venetian masquerade masks. VONROSEN - Berlin-based by-invitation-only luxury fashion label. Steve Jobs' iconic black VONROSEN cashmere sweater. WELSH AND JEFFERIES - 20 Savile Row, London, U.K. Since 1907. WILLIAM FIORAVANTI - New York City, NY, U.S.A.
William Hunt - 41 Savile Row, London, England, U.K.
W.W.CHAN & SONS TAILOR LTD. - since 1952 one of the original "Red Gang", Hong Kong. Yeti - "The lightest down fashion collection: downcoats | downjackets | downvests."